Driver-centric updates are more the exception than the rule when it comes to India. The fact is, enthusiast cars don’t offer enough sales incentives to draw a manufacturer’s focus. However, one brand that has gone against the tide is Fiat. With launches like the Abarth Punto and Abarth 595 Competizione, the Italians have showcased their focus on the front seat time and again. With the latest update coming in the form of the Linea 125 S though, they’ve tried to balance both worlds. While the T-Jet engine now gets angrier, the cabin has been modernized with the addition of a touchscreen infotainment system as well. Effectively, they’ve made this enthusiast’s sedan more powerful, yet, more approachable. 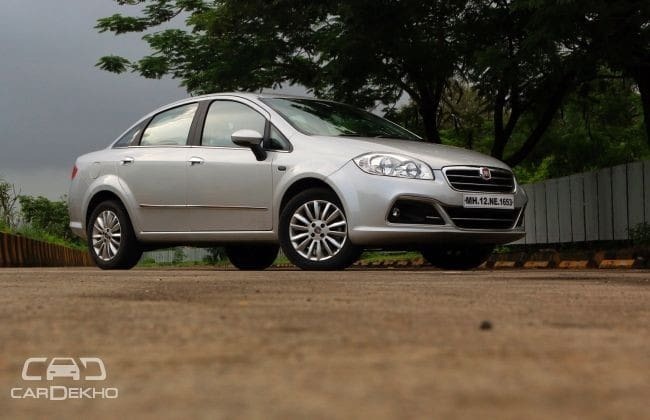 With it, Fiat India will be hoping to give its weak sales a little protein. So we got our hands on the 125 S to see how different the updates make the Linea and answer one very important question - Is it enough? Credit where it’s due, Fiat did a great job with the refreshed Linea and gave the car a rare dashboard that’s befitting of the word ‘beautiful’. The cabin is consistent with the understated exterior and with the addition of the new 5-inch touchscreen infotainment system with navigation (by MapmyIndia), it gets a much-needed dose of functionality as well. The system supports AUX/USB/SD Card and Bluetooth connectivity, but in the trade-off, you lose Microsoft’s Blue&Me voice command system. The system gets the job done, but has nothing noteworthy. It’s not as polished as the setup you get in the Volkswagen Vento and there’s noticeable amount of lag in the touch response. What’s also odd is that while Fiat says it is rear camera compatible, the car doesn’t actually get one. Given the small screen size, it can also get tricky to use on the move. That said, the sound quality from the speakers is good and when combined with the Linea’s great cabin insulation, it makes for a pleasant ambience. Speaking of which, you also get orange ambient lighting which will make you feel all warm and fuzzy on a late night drive. The leather draped seats are very supportive and well-padded, not to mention, they feel premium too. On the flip side, while the Linea is the longest car in this segment, that doesn’t translate into great cabin space. Fitting three at the rear is a squeeze and if the front seat occupants are around 6 feet tall, there’s little knee room left at the back. The interior trim quality is appreciable, but it’s not a very practical design. The door pockets are too slim to hold 1-litre bottles and the only place for your cellphone is under the handbrake. The 500-litre boot, though accommodating, also has large wheel arch bulges which makes storing full-sized suitcases a bit tricky. Well here’s the bit of the review you’ve been waiting for. The T-Jet turbo-petrol has now been uprated to produce 125PS of power at 5000rpm and 208Nm of torque at 2000-3500rpm and still comes paired with a 5-speed manual gearbox. As expected, this engine behaves like a puppy on a sugar-rush. The throttle response is immediate and while you do get a turbo-surge, there’s no noticeable lag before it. This makes it a city-friendly engine with adequate performance for moderate speeds, not to mention, the engine note’s pretty sweet too. Slam the accelerator and you get wheelspin quite easily and yes, there’s a good amount of torque-steer that can kick in even in 2nd gear. The motor has a great mid-range though, which makes it a joy on the highway. However, while the engine is now 11PS and 1Nm wealthier, it’s only marginally noticeable when you drive it. The brickbat though, still goes to the transmission. The clutch isn’t heavy, but the long travel makes it cumbersome to use, especially in the city. You have to drive the car for a while to perfect the clutch’s bite point, which may involve stalling a few times. The gear lever too, is still rubbery and isn’t sure slotting. Can you adapt to it? Yes, but if a car is aiming to be the best performance sedan in the segment, the gearbox should’ve been a benchmark. As always, the Linea gives you that oh-so-desirable Euro-car ride quality. The car deals with potholes and road imperfections very well, keeping things comfortable in the cabin. It isn’t as settled as the Vento TSI at triple digits speeds, thanks to the 190mm ground clearance and comparatively softer suspension. However, it strikes a good balance of practicality and dynamics, and it won’t crash through potholes like the Volkswagen. No surprises that the 125 S is a great handler too, and while the steering is a bit heavy, it translates to a very involving drive when things get spirited. The 205 section tyres offer great grip and look cool too, though the lack of mud flaps results in these wide wheels spattering the front doors/rear bumper with debris. The four-wheel disc brakes bite quite sharply and need some getting used to, but they are very reassuring and offer great stopping power. Something you will need with a car that can hit illegal speeds without breaking a sweat. Fiat has done well to introduce the new updates and, true to its core values, the brand hasn’t shifted focus away from the driver. By giving the T-Jet motor more power, the Italians have made the 125 S one of the best driver’s cars you can buy at a reasonable price (Rs 10.46 lakh, ex-showroom, Delhi). However, these token additions aren’t enough to make the Linea sell significantly better. Apart from Fiat’s sales and service network being more of a gamble than a bet, the Linea itself is showing its age and even Fiat lovers are shying away to more proven alternatives. The company needs to revamp its presence in India and go beyond the Linea-Punto formula to win over new buyers and reassure the loyalists that Fiat is indeed, crafted for car lovers. Powerful turbo-petrol engine is a great performer. Dynamically sorted with a great ride and handling package. 5-inch touchscreen infotainment system improves the interior’s functionality. Rubbery gear lever and long clutch travel. Rivals offer more comprehensive entertainment systems. Fiat’s sparse sales and service network.